Check out my interview with Crystal Chan over at From The Mixed-Up Files of Middle-Grade Authors. Comment and enter to win a UK version of her wonderful debut novel, Bird. My interview with Kurtis Scaletta is up over at From the Mixed-Up Files of Middle-Grade Authors. He's giving away a signed copy of The Winter of the Robots. Shawn McGuire, Shannon Delany, Laurie J. Edwards, Janet Fox, and Sarah Prineas. Write so fast your hands get blurry! Check it out here, and add some tips of your own to the comments. Welcome to the 21st Century, Einstein Anderson! I've been blogging over at From the Mixed-Up Files of Middle-Grade Authors. Today I posted a piece on the reboot of Seymour Simon's Einstein Anderson series. 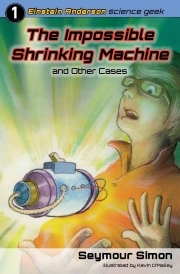 I've been giving presentations on Sciency Fiction lately, and I've been asked to post a list of sciency fiction titles. Suggested age ranges are in parentheses. If the book is part of a series, only one book is mentioned, usually the first. So here it is. I hope to keep it updated, and suggestions are welcome. If you like kidlit and you like science, The Middle Grade Science Project is for you. Elaine Vickers profiles middle-grade books with science content, and lists some ideas for books that might appeal to readers who like the profiled book. She also has links to websites with related science content, as well as a whole post a little later in the week with a science activity. Last week she profiled The Reinvention of Edison Thomas and had a molecule-building activity with gumdrops. There's also an interview with the author (that would be me) and a giveaway. If you want to enter the giveaway, do it soon. Entries must be submitted by December 5. 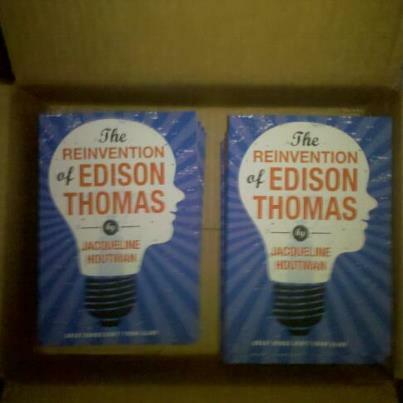 Over at From the Mixed-Up Files of Middle-Grade Authors, I blogged about Sciency Fiction and I'm giving a set of up to 15 ARCs of The Reinvention of Edison Thomas to one lucky school or library. Tomorrow I head up to Sheboygan, Wisconsin for the Third Annual Sheboygan Children's Book Festival. It'll be my first time attending, since I had scheduling conflicts the last few years. I was in Sheboygan last year for the World Premiere of the stage production of The Reinvention of Edison Thomas. This year, I'll be talking about Sciency Fiction, participating in some hands-on science, signing books, participating in an author panel with Ilsa J. Bick, Lisa Albert, Sarah Weeks, and Julie Halpern (moderated by Mitch Teich), and signing some more books. Here's my festival page. The complete schedule for the festival is here. Look what the nice lady in the brown truck brought me! It's Random Acts of Publicity Week! It's also the first week of school and kind of hectic, so I'm just going to post cover images of some of my favorite middle-grade sciency fiction books. I'm working on some talks and blog posts on the subject, so stay tuned. In the meantime, check out these titles if you love science (and even if you're on the fence about it).